We took a look at SnapPower's new product that recently finished funding on Kickstarter and how they tried to improve decades-old technology. It’s a product everyone wishes they had when they were kids: a light switch that turns into a night light. How many times have you run up the stairs after turning off the light to avoid being dragged down to the basement by a monster? Maybe your fear of monsters has faded since reaching adulthood, but that doesn’t mean you don’t need help with not stubbing your toe on every piece of furniture in the middle of the night. Enter the SnapPower SwitchLight. While its creators had an original goal of raising $25,000 to fund the product, it raised $332,114 thanks to the 7,364 backers that supported it. Sean Watkins, the Founder of SnapPower, and his team didn’t know what to expect when they launched their product on Kickstarter — but it had a great turn out. “Any time a new product is released the reaction varies, so we were very pleased with the response to say the least,” said Watkins. It’s pretty easy to install as well. All you have to do is unscrew your existing light switch cover plate, and replace it with a SwitchLight plate. No wiring and batteries needed. This product is energy efficient and uses less than 10 cents of energy per year, so you don’t have to worry about your electric bill. The SnapPower SwitchLight has high quality, soft white LEDs that glow at 4,000 Kelvins, and can last up to 25 years. 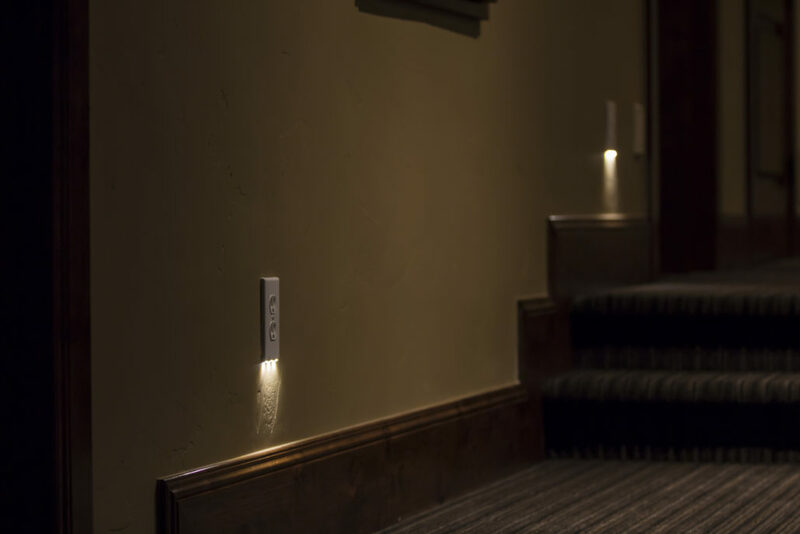 When the lights are switched off and the night light is activated, the light shines downwards and towards the floor. At the bottom left of the unit is a switch allowing the user to dim the light or turn it off completely. No extra power is needed, opening up more space in your wall outlet for more important things. Watkins’s partner Jeremy Smith is the electrician who came up with the SnapPower SwitchLight idea 16 years ago. He worked on the idea for many years and, finally, settled on the current design. “Jeremy has always considered himself an inventor and as an electrician it was natural for him to invent an electrical product,” said Watkins. “We have around 25 employees and are growing fast,” Watkins said about The SnapPower company. His goal is to create a product line of powered cover plates that is recognized and used by every household in America. With the money the company has raised, it will be using it to order additional inventory. Currently, SnapPower only ships to Canada and the United Stat. It comes in three colors: white, light almond and ivory. Early bird pricing for a single unit starts at $10 US on Kickstarter along with additional unit bundles offered. I like this idea. Even though it does not make sense to put one on each outlet, it does in some areas of the home. This will really take place of the lighted switch that we saw back in the 80’s and such. I would hope that at some point a person could by 5 of these in a package for like $30-$40. I think these would be great for a child’s bedroom. Right? I have always thought about something like this. It just makes sense because the power for the light switch is right there. Why couldn’t you use it for a night light? Awesome idea by this company and they did some nice engineering to keep it clean and easy for anyone to use. I am trying to think of a way these might possibly fail. From what I am reading, the installation seems pretty safe and the overall, extended use, seems like it would be pretty safe. That is a major bonus when you are dealing with electricity and existing power lines. Awesome idea! There are so many comedy bits about being dragged around the house by that monster. I am sure we have all been there and if you are reading about the campaign on the kickstarter page, you might even be thinking about getting one, just like I am! One is awesome, but I want to put about 5 of these throughout the house. I hope they sell packages.